Police are looking for a man who—in what seems to be a plot ripped right out of a bad mob drama—disguised himself as a delivery man and shot a woman with a crossbow. Peel Regional Police say the attempted murder—which they described to the Toronto Star as a “targeted attack”—occurred in Mississauga on November 8, 2018. In an attempt to gain the public’s help, authorities released security footage of the attack on their YouTube channel Monday. The suspect, who was caught on an infrared security camera, waits at the door with a large box in one hand. The other hand is stuck in the back of the box presumably holding the stock and trigger of the crossbow. After exchanging words the man fires point blank at the woman, who suffered life threatening injuries. 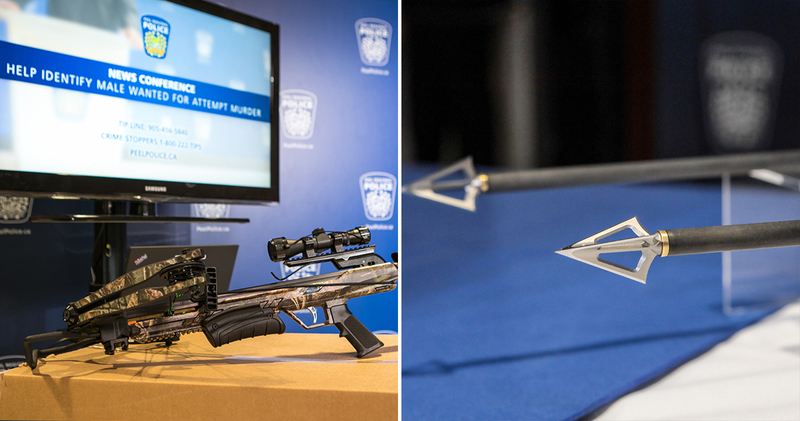 Photos showing a similar crossbow and arrows as were used in the attack. Photos via Peel Regional Police. A police spokesperson told the Star the woman’s injuries, which affected her internal organs, are “absolutely devastating” and that she’ll be “in [the] recovery phase for the rest of her life.” The attempted murder was likely at the request of another person, according to comments made to the victim before the attack. Police say that the attacker was in dark clothing—they just look bright because of the infrared camera and fled in a dark coloured pickup truck. They are asking that the public to contact them if they have any information regarding the shooting.